The first time I tried guacamole was in Playa Del Carmen, Mexico. And my favourite cuisine at the time. We’ve travelled extensively since that first visit and while I have come to love many different cuisines all over the world, Mexican has always remained near the top of my list. But we wanted to delve deeper than the typical tourist food on 5th Avenue or the Tex Mex we were familiar with stateside. 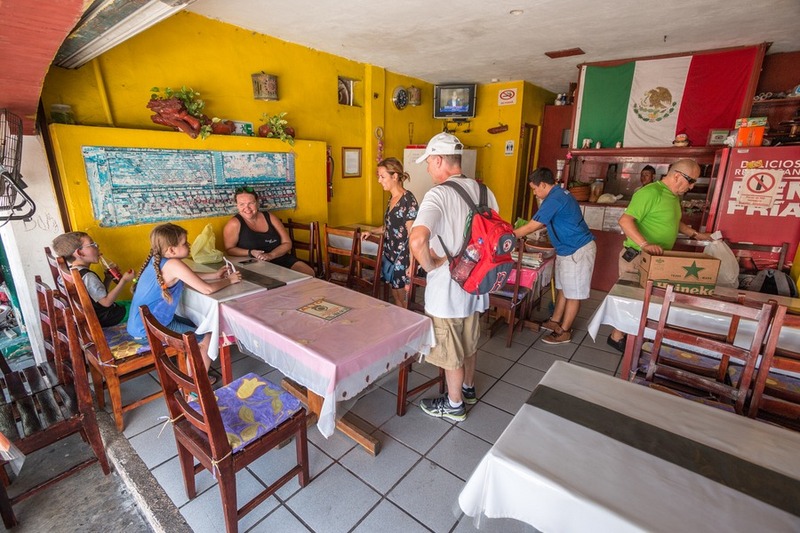 So Viator organised a Playa del Carmen Food Tour for us to get the real authentic Mexican experience we were so hungry for. Our meeting spot was easy to find opposite the central bus terminal. Our friendly guide came prepared with bottled water for each guest (phew! ), and off we set. We caught a couple cabs during the tour (included in the tour price). So there was not a lot of walking compared to other food tours we’ve done in the past, which was really great for little legs. Located across the road from Mega shopping centre, we started with a small restaurant with room for about 4 tables and a bench. Three ladies inside were cooking fresh quesadillas. We all sat down to try three varieties: chorizo, cheese and corn. The standard quesadilla is made with a flour tortilla filled with cheese, however they can be made with a corn tortilla and filled with a variety of savoury mixtures (some don’t even include cheese!). 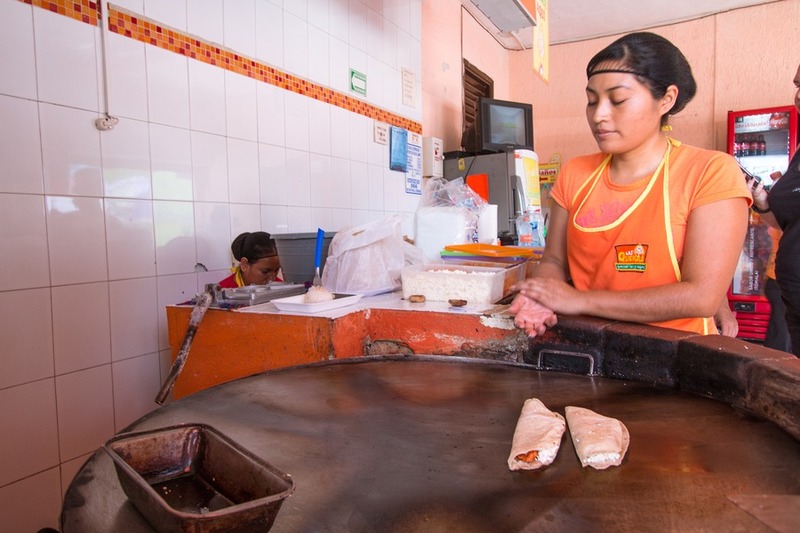 These ladies make their own corn tortillas and use authentic Oaxacan cheese (the real cheese that is supposed to be in this Mexican dish). Josh loved the quesadillas, while the kids and I were not big fans. We did enjoy a Mexican Coke, which is very different to the US version as it’s made with real sugar rather than high fructose corn syrup. 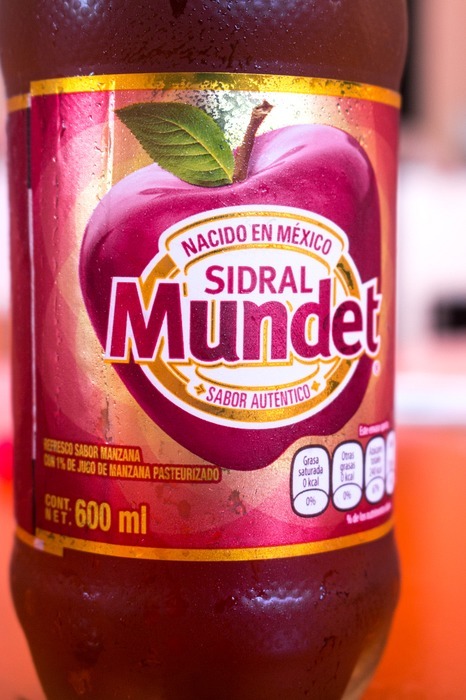 We also got to try a new apple soft drink, which my son, Caius, thought was the best thing since sliced bread. 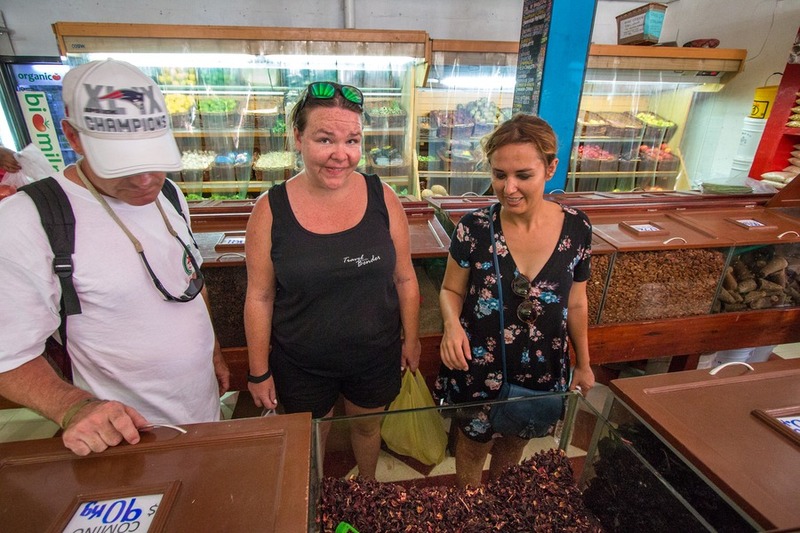 The farmers market was not open, so we stopped at a local store filled with fresh fruit and vegetables, as well as barrels of dried spices and chillies. Our guide patiently pointed out several different fruits and chillies that are native to the area. It was a little squishy in the store and unfortunately we didn’t get to taste any of the items, but it was interesting to see where the locals shopped. 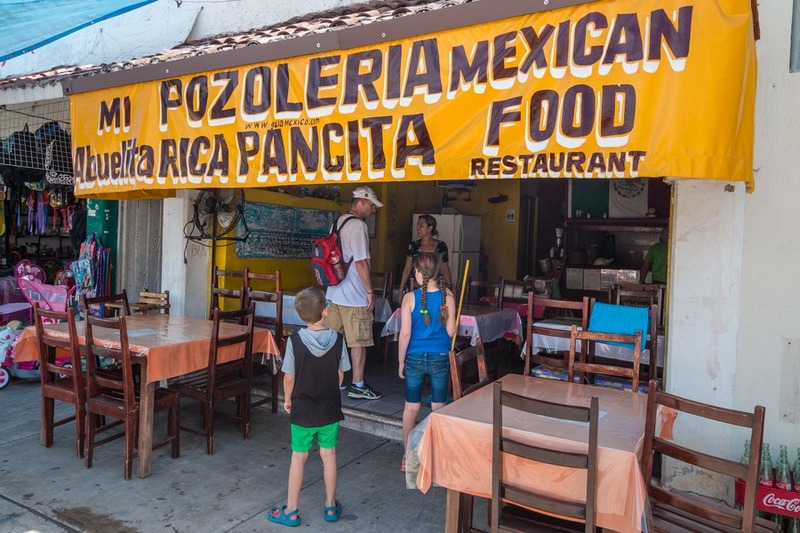 Our next stop was a local Pozoleria. 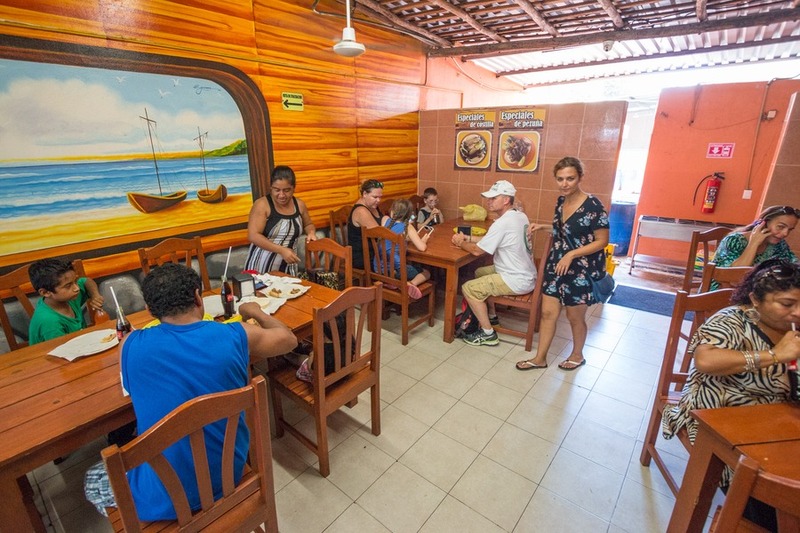 Another small hole-in-the-wall restaurant with about 4 tables and 2 staff. It was here we tried Jamaica. No, it wasn’t a slice of a Caribbean island, but Josh thought it might have tasted like that. Jamaica is a refreshing Hibiscus Water, similar to a cranberry tea drink. Once again Josh loved it, while the kids weren’t completely sold on the unfamiliar flavour. After our Agua de Jamaica, we were each served a bowl of hearty Mexican stew, known as Pozole. The soup is made from nixtamalized cacahuazintle corn (process of soaking corn in alkaline solution), better known as hominy. In addition, pork typically used. We tried the chicken variety in an almost tomato-like broth. A layered plate of extra toppings was served tableside to add to the soup – lime, lettuce and chillies. My son loved the soup and nearly finished the whole bowl. Mia and I were a little more cautious. Me, more because of the heat than the actual flavour. Without second thoughts, Josh polished his off completely. My favourite stop, hands down. A short cab ride later and we were on one of Playa’s busiest streets, and our next restaurant. We walked in to a modest dining room, filled with low-key wooden tables and chairs and a quiet chef efficiently chopping pork. Carnitas! Yum! Carnitas translates to “little meats”. This pork dish is typically done in the Michoacán style with a selection of meat (pork) “cuts” that are roasted/braised at low heat in a copper pot. The pork is seasoned with salt, oregano and many times crushed garlic. We sat down at the back of the restaurant and were served a tray of condiments – guacamole, hot sauce, chillies and other bits and bobs. We were then given a choice of “greasy” or “non”. We ordered one of each so we could compare both. 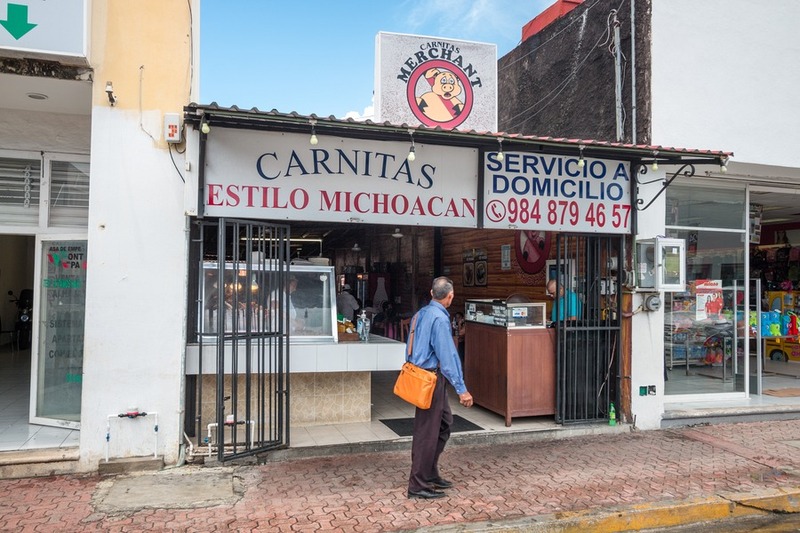 I preferred the greasy vor cochinita pibil, it was by far our favourite Yucatecán street taco (and not particularly greasy in an unpleasant way, I’d call it juicy). The tortilla was soft and light, and just thick enough to contain the full-flavoured meat. I could have devoured several more of these. Our last stop was at a cute, small stall selling handmade, artisanal ice-cream. 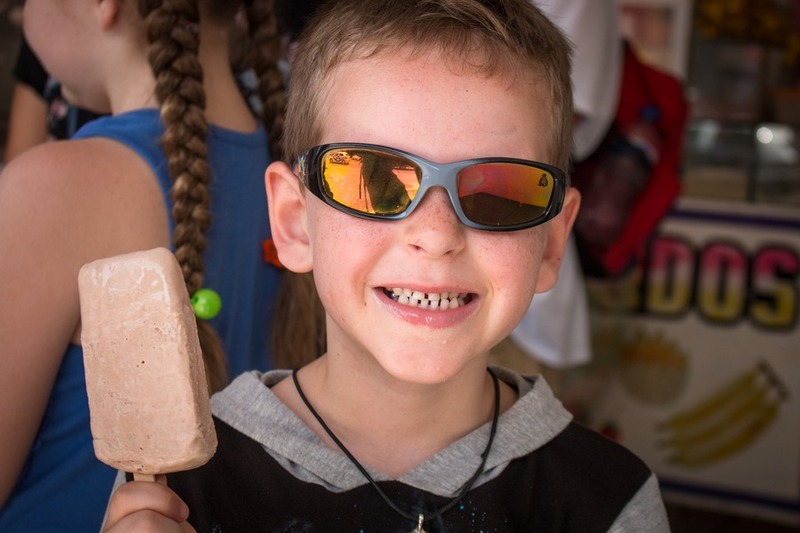 Nieves is the Spanish word for snow and is a general term for frozen Mexican treats. Each guest on the tour choose a flavour. The kids opted for cookies and cream and chocolate, while I ordered a coconut. It was a surprisingly large serving that I couldn’t finish. 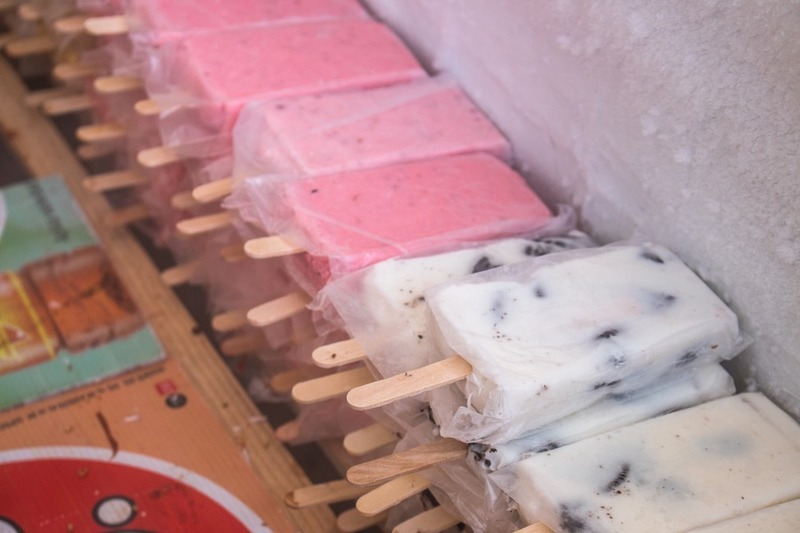 The ice cream texture is quite Icey, not as smooth or creamy as typical commercial ice cream, and tended to melt fast in the hot sun. But the flavour was delicious and refreshing. After the ice cream, our guide walked us back to the plaza near where we started and said her goodbyes. I was a little disappointed that two of our planned stops were closed on the day. Our first food truck stop was not operating and the open-air food market was not open either. On top of this the food costs didn’t make this the most economical tour. The quesadillas and tacos were 15 pesos each (US$0.80), pazole is about US$4 and an ice cream is US$1.34. This meant the food tour was not what I’d consider the best value for money. 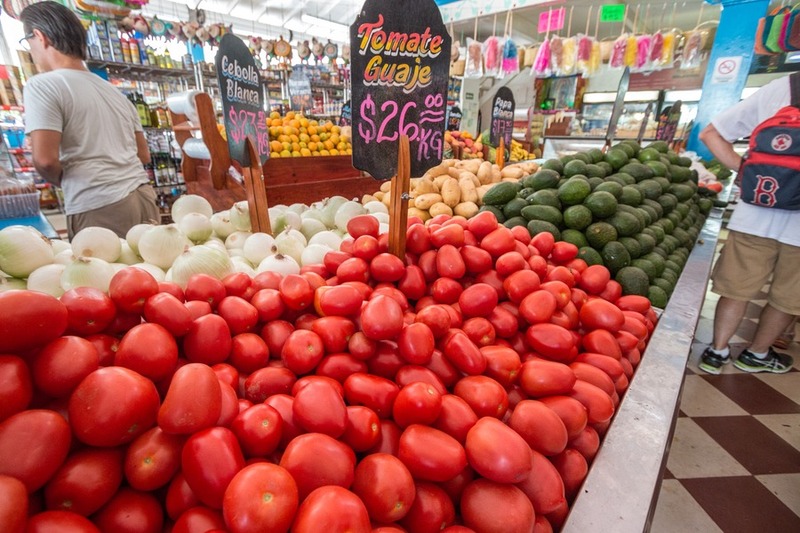 Perhaps if you are interested in trying real Mexican from local vendors without spending time researching all the options, then this tour would be perfect for you. 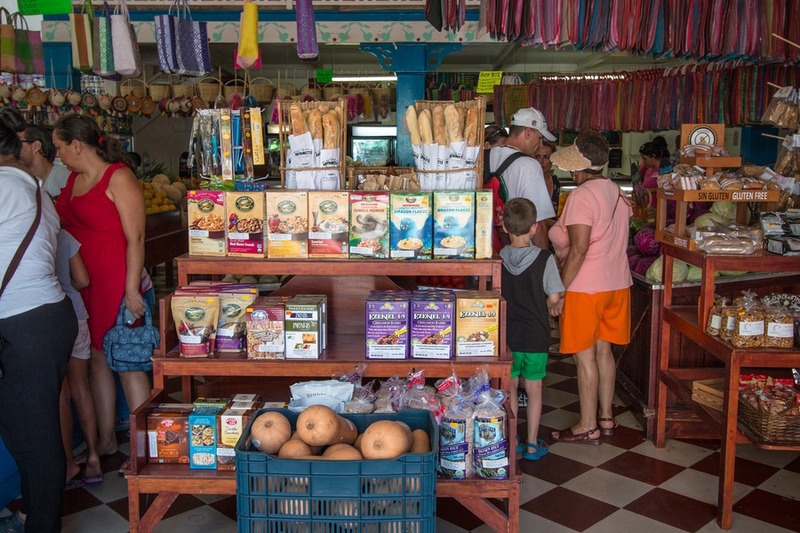 If, however, you enjoy a bit of research and are happy to walk through town and order food (in Spanish) from these stores you could carry out the food tour for yourself at a fraction of the cost. Josh and I feel quite differently about this food tour. He ate everything, enjoyed it all and was beyond stuffed by the end. The kids and I left hungry. In fact, we got the kids Subway soon afterwards. So we don’t have a definitive outcome. It really comes down to personal preferences. Would I recommend the tour? Possibly not. For me it was not the best way to spend US$65 in Playa Del Carmen, considering the food costs. I’m relatively adventurous and wouldn’t mind striking out in a city like Playa on my own. However, the other tourist in our group thought it was great value. So it’s all relative to expectations, time constraints and budgets. But would I eat at the places we went to again? Definitely! 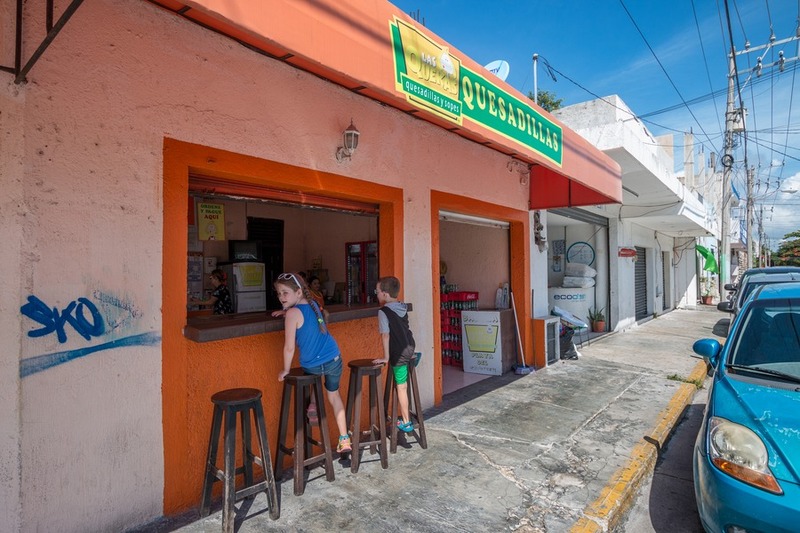 The local food was authentic and although some of it was not to my taste (I discovered the great disparity between Tex Mex and real Mexican cuisine), I plan on heading back to the taco restaurant again and again. So I consider that discovery a big win – both for flavour and my hip pocket. Does it have to be Mexican or an Latin food? Pebre is my favorite - Chilean...so yummy! Amen that you have discovered Guac! Will be an all-time favorite. My favorite Mexican dish are deliciously flavorful carne asada tacos. When done well, they are a dish that makes me sing when I eat it!